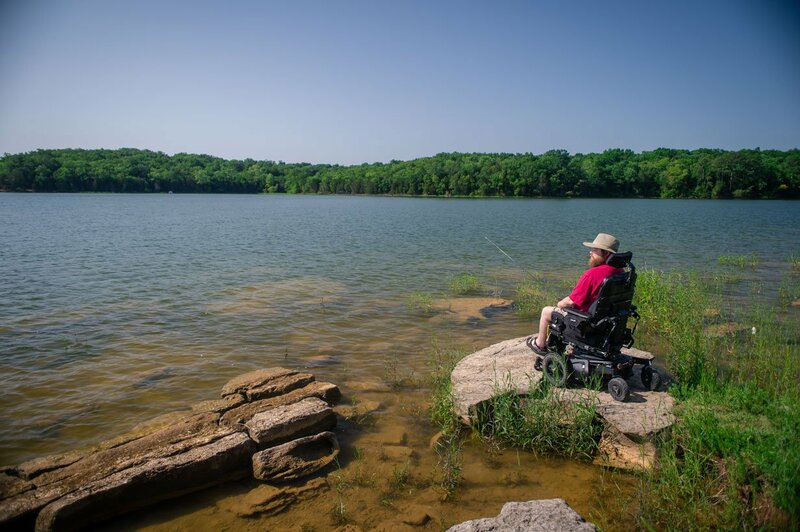 This week we're pleased to feature Robbie Vance and his uplifting account of how getting his power wheelchair opened the door to opportunities and helped him recover many parts of his life that facioscapulohumeral (FSH) muscular dystrophy had taken away. My thirtieth birthday came just days before the chair became my unwelcome roommate. From the time I was a six-year-old playing tee ball, facioscapulohumeral (FSH) muscular dystrophy had been stealing from me. It started by stealing my ability to run and play like the other kids. Then, it stole my ability to raise my hand over my head to be recognized in class. It took my ability to get up off the ground when I would trip and fall. I tripped and fell more often because it stole my balance and my ability to pick up my feet sufficiently when I walked. It stole my self-confidence through the embarrassment that resulted from my public displays of physical awkwardness. It stole my ability to climb stairs followed by my ability to get up out of a chair without great effort. It stole my desire to go places in public like restaurants or movies where I was sure everybody would be pointing at me and whispering to their friends about the crippled guy. It took my ability to fit in, to go somewhere and not be noticed, to not be viewed with fear or pity, to not be the guy that people are afraid to approach, to not be assumed to be mentally challenged because I can’t do the Macarena. Before going out into the world, I did a cost-benefit analysis of the calculated risks and levels of reward. Whatever I wanted or needed basically had to be accessible from my truck window or it had to come to me. I would only go to work or to visit friends and family where I knew there wouldn’t be any major impediments to my limited mobility. If I needed food, it was delivered, came from a drive thru, or I would go to Mom’s kitchen across town. These limitations caused me to gain a good bit of weight, unfortunately. Eating mostly fast food and pizza, coupled with my inability to exercise, exacerbated a vicious cycle where the extra weight made it harder to get around which made me exercise less which made me gain weight and on and on. I rarely let anyone take my picture or videotape me. If I didn’t have to see my physical awkwardness, I wouldn’t be reminded of it, and I wouldn’t have to deal with it. But inevitably, I would trip and fall or something else embarrassing would happen and the reality of my diminished physical capabilities would kick me squarely in the jaw. While the necessary daily activities like getting out of bed and getting dressed for work got more and more difficult for me as the days, months, and years passed, I tried not to let it show. I was fiercely independent and pressed my insistence to remain independent much further than I probably should have. I should have been using my chair a long time before I did, but it sat in my guest room for the first few months after being delivered, being used for nothing more than the infuriating target of my disdain, the harbinger of my inevitable future as a helpless cripple. I should have taken many other steps to deal more realistically with my needs much earlier than I did, but I was hardheaded, as is the case with many in my red-bearded Irish lineage. The first time I used my chair in public was on December 29, 2007. It was a cold, clear day with a stiff breeze blowing from the northwest and swirling through the Liberty Bowl stadium in Memphis. Dad and I drove up for the late afternoon kickoff to see our alma mater, Mississippi State, beat the University of Central Florida in the first bowl game I’d ever been to and the first football game I’d been to since I was in grad school. The temperature nose-dived as the sun dropped below the rim of the stadium, and the game didn't provide much of a distraction from the spreading frostbite as it was a real snoozer. Despite not being able to feel my feet or lower legs, I had a great time just being somewhere new, and I even hated my wheelchair a little less than I did before we left home that morning. It was the first time I’d been able to get around without struggling and exhausting myself in a good many years. My football outing changed my attitude toward my inanimate roomie. While I wasn’t ready to be friends just yet, I didn’t want to shove a grenade in its figurative tailpipe ether. Progress is progress. Right? In January 2009, I received a promotion at work, and one of my new job responsibilities was to organize a meeting involving the Governor and a few other high-level elected state officials. This meeting was to take place in February in the Governor’s conference room, which was in a building a few hundred yards away from my office. It was too far for me to walk, and parking near the building wasn’t abundant. So, I decided it was time to bust out the new ride and roll in my office like I didn’t give one single damn what anybody thought about me showing up in a chair. Last summer I sat down in my 3rd power chair, an all-black Permobil F5 Corpus VS that is by far the most comfortable seat I’ve ever owned. Then, a few weeks later, I did the most out of character thing I’ve ever done, and I thoroughly enjoyed every second of it. 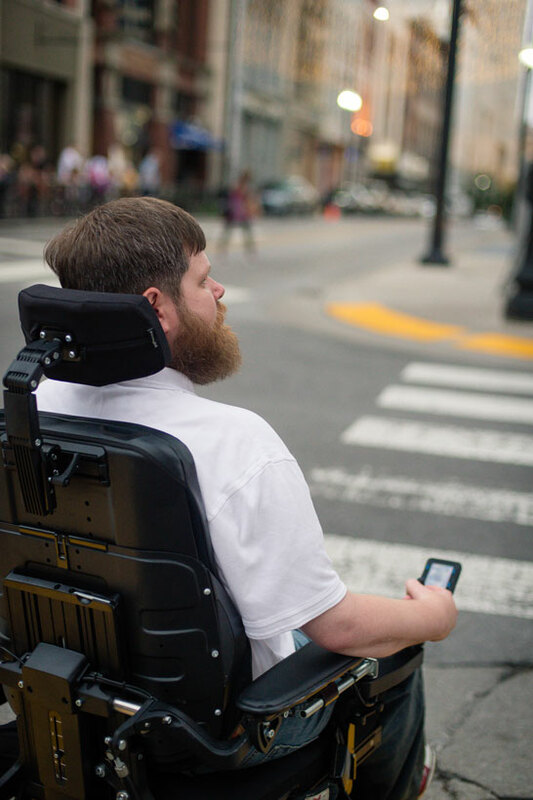 I took a trip to Nashville to visit Permobil and have my photo taken for their new website. I rode 7+ hours to Nashville to do the one thing I liked doing less than just about everything else in life. Over the course of the four days I was there, I got to meet and make friends with lots of great people and have my photo taken by a fantastically talented professional photographer who managed to accentuate my positives while cropping out most everything that made me uncomfortable about myself. It was not only a fun trip and a much need vacation from my everyday life, it was one of the most therapeutic activities I can remember and had a profound effect on my self-image. Despite my fears, being in a chair has helped me recover many parts of my life from the FSH, instead of taking what was left. I’ll be 40 next month and even though the FSH is still progressing in ways predictable and otherwise, I’m thankful for every day I get to spend on the sunny side of the dirt. I don’t know what’s ahead, but I can’t wait to find out. I just hope it has a ramp.